manatees. Here are what others have to say. the Nature Coast including Ozello, and the Rainbow River. 2-3 hours. Launch times and durations may vary on Private tours. can be abbreviated or lengthened to meet the needs of your family. Stand Up Paddleboards, and are by design passive observations. pages line up with their rhetoric? (i) Chasing or pursuing a manatee(s). (ii) Disturbing or touching a resting or feeding manatee(s). (iii) Diving from the surface onto a resting or feeding manatee(s). (iv) Cornering or surrounding or attempting to corner or surround a manatee(s). (v) Riding, holding, grabbing, or pinching or attempting to ride, hold, grab, or pinch a manatee(s). including your hands and feet. (vii) Standing on or attempting to stand on a manatee(s). (viii) Separating a mother and calf or attempting to separate a mother and calf. (ix) Separating a manatee(s) from a group or attempting to separate a manatee(s) from a group. belts, harnesses, tracking devices, or antennae. (xii) Interfering with rescue and research activities. a. All waterborne activities in Three Sisters Springs from sunset to sunrise. c. Fishing, including but not limited to fishing by hook and line, by cast net, and by spear. observation deck at the park. encounters are your desire, please let us choose the best place for the meeting based on the current conditions. sometimes partners with one or two select professional qualified guides to fill in. Please Enjoy Their Company, But Resist the Urge to Touch. Note: While touching a manatee is not on the list of prohibited activities, we recommend, as does USFWS, a no touch ethic. 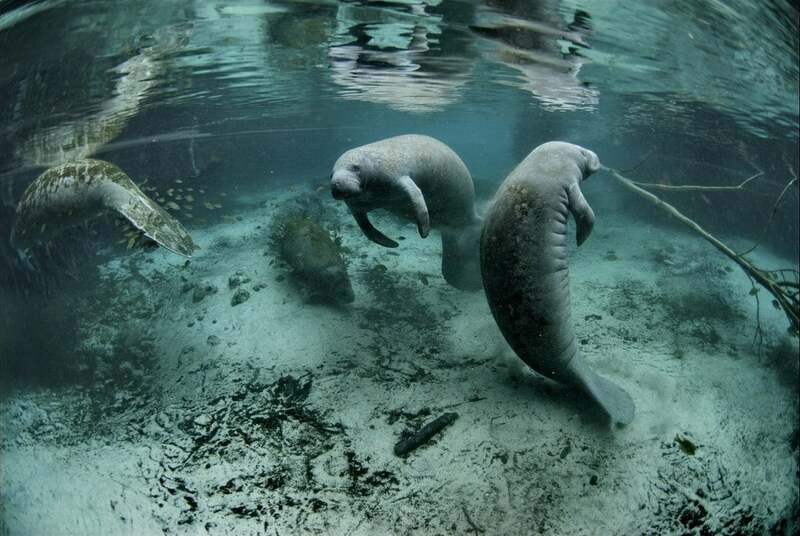 survival and contribute to injuries when manatees become too accustomed to humans. Keeping the wild in wildlife! From $50 pp includes the use of Aardvark's equipment. Manatees are wild animals and sightings cannot be guaranteed. Now booking for October 2018 and beyond. Warmer weather = Lesser chance.